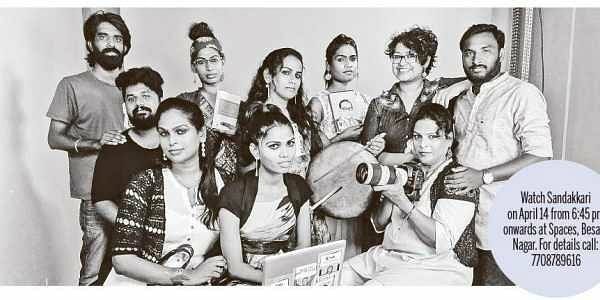 CHENNAI : Sandakkaari, a play on fundamental rights of transgender persons, is ready to take the audience on a journey through the lives of Prithika Yasini, Tharika Banu and other transwomen in the city, who have realised their career dreams against all odds.The play is the brainchild of Kattiyakkaari, a city-based theatre group, and Trans Rights Now Collective and a non profit organisation that works towards ensuring education and creating employment for transgender persons. The name Sandakkaari — a woman who often fights— was inspired by the words of a city police officer, claims Srijith Sundaram, the director, and founder of Kattiyakkari. The etymology is from a protest a few years back, staged outside the Secretariat, in which Grace Banu (founder of the collective) and other transgender-rights activists urged the government to provide them housing. Sandakkaari is a satirical play that revolves around the struggle of Tamil Nadu-based transwomen, who used the powers of judiciary, to find life and livelihood in mainstream society. “The play is not about showcasing exemplary role models for transgender persons, but about showing how to fight obstacles to access education and employment,” says Avipsha Das, associate director of the play. It touches upon several court judgements that impact the lives and rights of transgender persons. “Beginning from the NALSA judgement, Transgender bill, Prithika Yasini’s judgement to many others, we have files of content that show us what we’re eligible for. It’s time we put that information out for young, uncertain transgender persons to know how to fight their way through,” says Grace Banu, who is also acting in the play. The docu-fiction entails handpicked instances from the lives of the actors themselves. Contrary to several plays on transgender rights that focuses on abuse, this play will highlight the road map to access basic rights. The music is set to rhythm from Parai instruments, which the actors have learned to perform. The performance marks the beginning of ‘trans-season’ in Chennai that will go on till the month of May. Other actors include Negha, Sowmiya, Tharika Banu, Renuka and Kayalvizhi.